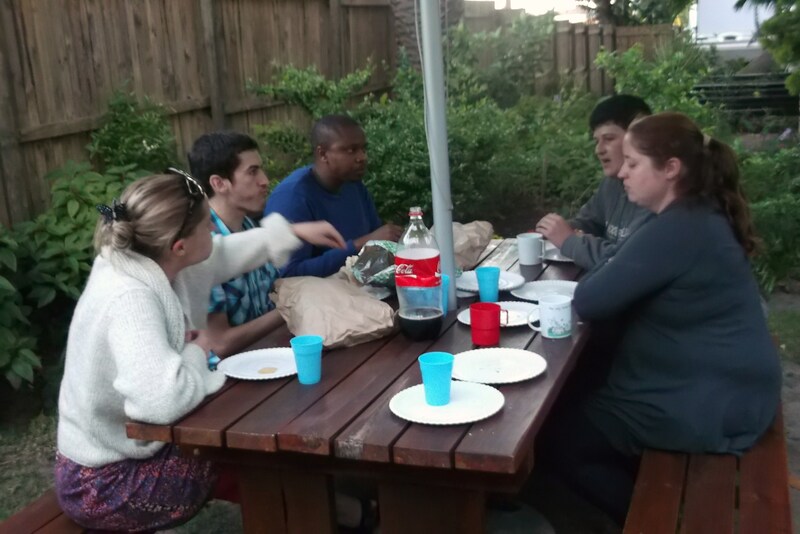 Tonight we cancelled our team training, took our dinner and together as a Gospel Community (GC) went to visit a friend who was struggling with depression and had been booked into Kenilworth Clinic for a couple of weeks. It was cold outside on the benches (even the smokers were not venturing out) but we ate together, prayed together, laughed together and encouraged one another in the gospel. It was great to see our friend who we came to visit encouraging other members of the GC in the gospel. We have been a few times to visit friends who have been booked into clinic. What encouraged me the most was that the last time we were there, it was just Jo, myself and the kids but this time we went as a community. A community who are learning to love Jesus and to love others. 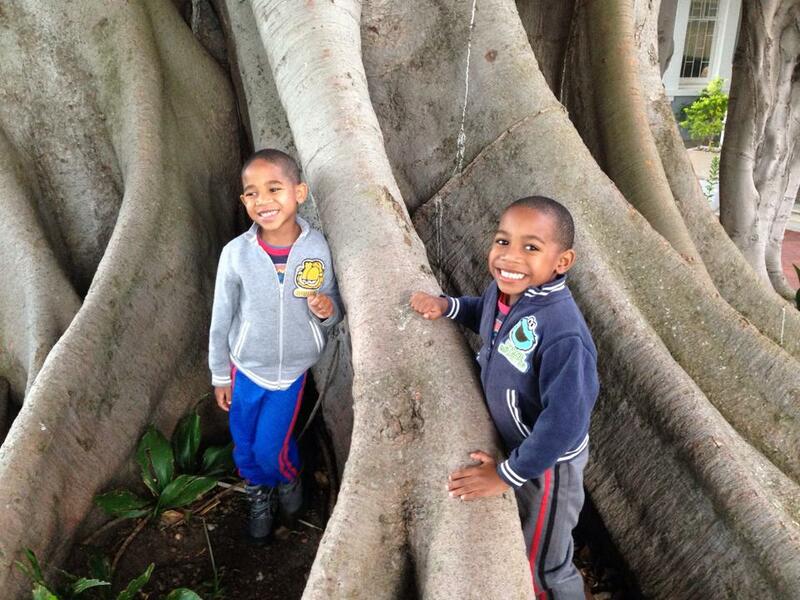 The boys of course got to play in the famous “rocket tree”… I love the fact that my kids know and look forward to playing in the tree at Kenilworth Clinic. I hope that they grow up visiting hurting and struggling friends at places like Kenilworth. I hope it is normal that they learn to follow Jesus as we try to love and serve our hurting, broken and struggling friends. This entry was posted in Church, Community, East City Initiative, Four31, Gospel, Gospel Community and tagged Church, Community, East City Initiative, Four31 Network, Gospel Community on November 22, 2013 by John. Last week we threw a birthday party for our friend J, who has never had a birthday party or even a birthday cake. Friends who are a part of our wider Four Three One community drove through from the other side of Cape Town. We ate together, gave presents, prayed for her, took a bunch of photos, ate cake, laughed and, of course, sang happy birthday. J and her family are a real part of our community even though she is not sure she want to “be converted” as she says. We talk about Jesus a lot with her but on that night we just wanted her to see that the gospel is good news. We wanted to show her that our God is a good king and to follow him is taste life, hope and joy now in part and one day in full. This entry was posted in Cape Town, East City, Four31, Poverty, Salt River, Woodstock and tagged Cape Town, East City, Four31 Network, Good News, Gospel Community, Restored Humanity, Woodstock on July 19, 2013 by John. So now you know how we got here. Confused, yes me too. I am not sure really where here is either, except we are not there anymore. One last thought, if you are part of a church, which you love, then you probably will not understand the need for what we are doing. You could not imagine that anyone would not be loved and feel welcome at your church. Without breaking down something that is obviously good in your life, trust me on this… they will not love it, they might hate it, they might be offended, they most probably will just not care! Your exegesis may leave them cold, your worship may freak them out, your liturgy may confuse them and the fact that you smile a lot, only sing happy songs, don’t swear and all seem ok, will probably confirm what they already knew when they walked in… they don’t belong! Having to nip out the back for a sneaky smoke will confirm it. As the community of God’s people we are set free to once again discover what it is to be truly human. And it is this life of the Trinity, this life of Creation that we are busy discovering. It is into this life together that we invite others to come and join with us, journey with. It is a life of peace, of joy, of hope and of rest! You may also like to read part one, part two, part three, part four and part five of these ramblings. This entry was posted in Cape Town, Church, Church Planting, East City, Four31, Gospel, Gospel Community, Missional, Salt River, Woodstock and tagged Church, Church Planting, Community, East City, Eating Together, Gospel Community, Missional, Missional Church, Rest, Restored Humanity, Vincent Donovan, Woodstock on July 3, 2013 by John. Don’t forget we where still homeless, we were not a part of a church network or a denomination… not even a book club really! So what were we to do? The guys we loved theologically were a bit hesitant about what we were up to… really no Sunday service (although I did hear someone refer to The Story as a Sunday service… epic fail! ), no preaching (more correctly no monologue but shall we save that for another day?). Basically it felt like we love you and you have good intentions but you are going too far… Why are you trying to do church differently. After all it has been working fine all these years. Look at all the people just like me that have been saved. The guys who do get what we were trying to do, are the guys who are a bit trickier theologically, very broad, a bit slippery on some key questions and just a little bit fruity (love you guys!). Mostly they longed for church to be different not for the sake of mission but for the sake of their (and their tribes) preferences or desire to see more social action, more authentic worship (by this they normally mean singing), better community or less autocratic authority. Honestly I can relate to a lot of this – sometimes the happy Hillsong crowd drives me balmy. And if I hear one more vision about the new building I might just vomit. But yet all of this is pretty much just about me. What would me and my friends prefer? What are my pet peeves, well let’s create a new community that does worship/social justice/ teaching / community better? What if Monday night was the best time to get together as a community… would you really give up Survivor? What if the time that you could best connect with the people you are trying to reach is not a convenient time for you… would you do it anyway? If the answer is no, then who is your church community really for anyway? You and your tribe? Or those who are lost, broken and without hope in the world? Seems like Jesus told a few stories about those who were lost… But then he did get nailed for it, so probably not the best plan right? You may also want to read part one, part two and part three of these ramblings. This entry was posted in Cape Town, Church, Church Planting, Community, East City, Four31, Gospel Community, Missional, Salt River, Woodstock and tagged Church, Church Planting, Community, Contextualization, East City, Four31 Network, Gospel Community, Mission, Missional Church, Woodstock on June 28, 2013 by John. We soon realised that as God began bringing people to us, (Honestly I am not even sure where they all came from?) The Story was not going to be enough for us as a community here in the East City, if we were going to grow in the gospel and be a community on mission together. Discipleship is always in the simple, ordinary bits of life together – a once a week story was never going to cut it. We needed to consciously reshape ourselves from a group of people who gathered for a once off event on a Sunday to becoming a gospel community. A group of people who have committed to sharing their lives together, and being on mission together in this place. To help us start thinking through how we do that we started to meet together on a Thursday evening. Studying Scripture, sharing our stories, dreaming and planning for mission, eating together, praying together and sharing communion. My favourite parts are always when those who by their own self-designation are not Christ-follower yet ask us to pray for their friends who they have invited. It has not been mainstream, it has not been ordinary but someone said to me last night while we watched the dishes… “I cannot shake the feeling that God is doing some amazing here!” And I thought it was only the idealistic dreamer that thought that! You may also want to read part one and part two of these ramblings. 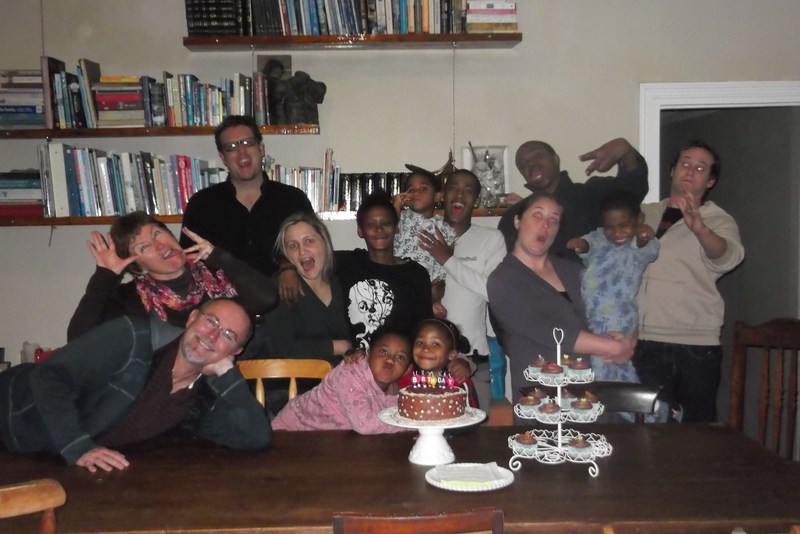 This entry was posted in Cape Town, Church, Church Planting, Community, East City, Four31, Gospel Community, Missional, Salt River, Woodstock and tagged Cape Town, Church, Church Planting, Community, Contextualization, East City, Eating Together, Following Jesus, Four31 Network, Gospel Community, Missional, Missional Church, Woodstock on June 26, 2013 by John. It seems like an age ago that we arrived back from the UK with yet another feeling of now what? Our tenuous official link with the wider Christian community was severed once again (albeit not at the expense of relationships or integrity as has been the case in the past). What now? No people? No programmes? No sending church? No affiliations? No community? No one ahead of us? And yet somewhere in the midst of all that a deep rooted conviction that God has called us here to this place, to these people, at this time! Beyond that… not much really! The offer on the table was to move to the UK and be a part of movement, a people, a community. A people we loved, we were inspired by, we were encouraged by, a people on mission, a people among whom I would be proud to have my sons grow up. And it was enticing… a year ago perhaps we would have taken it. Would have thrown it all in and left to be a part of another people in another place. Don’t get me wrong it would not have been sinful or unfaithful, the UK definitely needs gospel workers. But it would have been wrong! I know now that God has called us to this people, in this place at this time! Without getting any funny super-spiritual kind of ideas it seems like God was waiting for that first step of obedience- that conviction to say no to a very good thing- to throw open not the one door we had prayed for but multiple doors… simultaneously! Never a dull moment with our God. I remember clearly sitting on my couch getting ready to initiate a conversation with a couple with whom we had been working through Porterbrook material for the better part of the year. 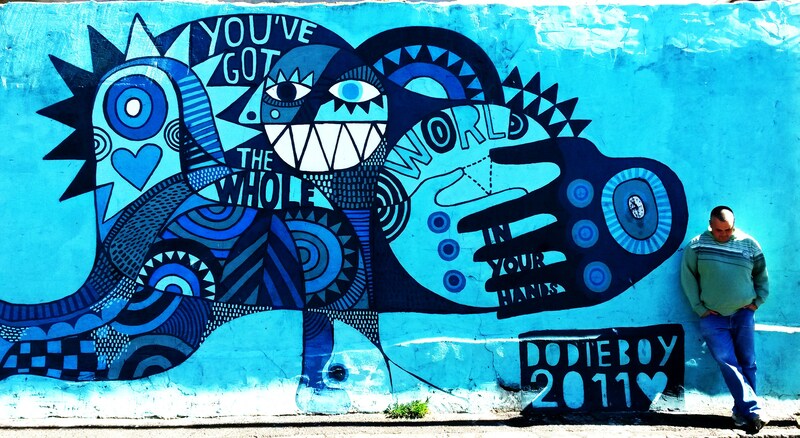 There has been no agenda to doing Porterbook, except a shared desire to work through some of the material. But as the year had gone on we had seen the lights slowly begin to go on in their heads and their hearts. As a result while we were overseas we had boldly decided to broach the subject of would you-perhaps-possibly-maybe-no pressure-if you like consider joining us here? Needless to say before the wheels of the plane had even smelt the African tarmac our reckless abandon to people’s approval of us had been… well… abandoned. But (to crib from CS Lewis) God was once again on the move… “While you have been away we have been thinking” they said “And we want to talk to you about something…” And suddenly thanks to our brave endeavour and reckless abandon to the gospel (just go with it, ok! ), a few months later our gospel community was 5 people. This entry was posted in Cape Town, Church, Church Planting, East City, Four31, Gospel Community, Salt River, South Africa, Woodstock and tagged Cape Town, Church, Church Planting, Community, East City, Four31 Network, Gospel Community, South Africa, Woodstock on June 20, 2013 by John.